So the outlet reported – on the basis of figures it says it obtained somehow from the Agriculture and Water Resources Ministry – that 450,000 tons of cotton were harvested in 2018, substantially less than the 1.1 million claimed by the government. 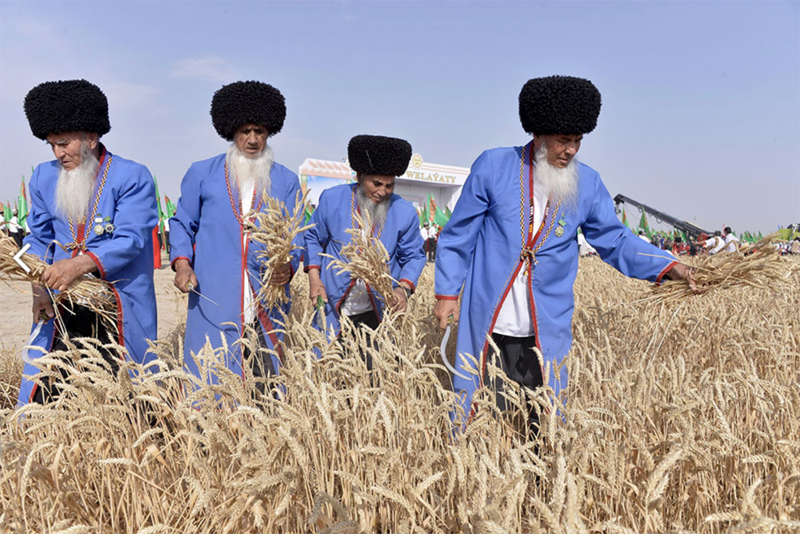 Around 538,000 tons of wheat were harvested, a third of the state plan, the website said. And some 30 percent of the harvested grain was reportedly unfit for consumption anyway. There are persuasive grounds for giving credence to such claims. Even in the capital, which should be relatively immune from such crude rationing, shoppers routinely report having to wait in long lines for basic staples. It is also suspicious that the Agriculture Ministry has been reshuffled twice in recent months – first in October 2018 and then again just last week. 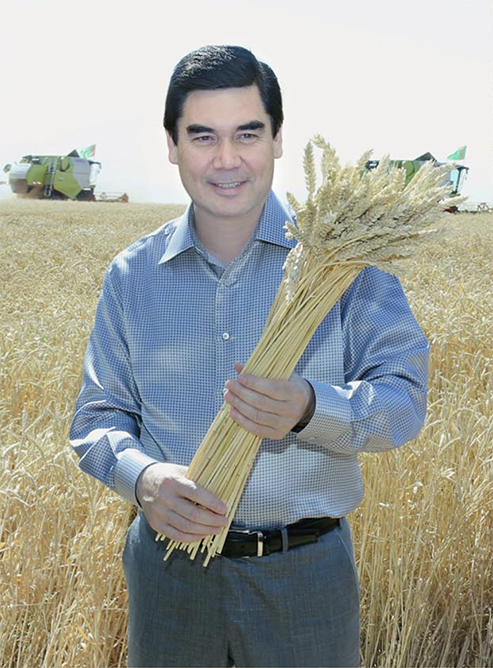 Undaunted, President Gurbanguly Berdymukhamedov has advanced even higher targets for wheat and cotton production in 2019 and 2020. The plan does envision a slight decrease in wheat output in 2020 as compared to the current year, but it is increasingly difficult to take any figures from the government seriously. In spite of the patently serious economic crisis gripping the country, the government has reverted to issuing monthly growth bulletins. Summing up January’s achievements, the deputy prime minister with the economics and finance portfolio, Gochmyrat Myradov, said the month had seen 6.2 percent growth. Such unearned buoyancy may be part of the government’s attempt to cast Turkmenistan as a promising destination for private investment. Seemingly to that end, Berdymukhamedov called on parliament last week to draft legislation on public-private partnerships. This is all idle puff, however. The vaunted privatization agenda is, as far as can be seen thus far, intended almost entirely to advance the fortunes of the Union of Industrialists and Entrepreneurs of Turkmenistan – a Frankenstein’s monster that is part industry lobby group, part holding company, part state corporation and, almost certainly, very large part a Berdymukhamedov family affair. Although exact figures are object of conjecture, it is a certainty that Turkmenistan’s economy remains as reliant as ever on the sale of natural gas and oil. Sales of gas to China are at an all-time high. And Turkmen officials this week met with representatives of their other major Asian partner, Malaysia – more specifically state-owned oil firm Petronas – about its investments in Turkmenistan. This is awkward since the Malaysian investments in Turkmenistan have played some peripheral role in the corruption scandal that has roiled the southeast Asia nation. The scheme that investigators in Kuala Lumpur claimed to have unearthed has allegedly seen billions siphoned off to benefit corrupt Malaysian officials and their Emirati and Saudi co-conspirators. Incidentally, the United Arab Emirates is also an investor in Turkmenistan’s oil sector and it too has run into some trouble. Environmental watchdog Crude Accountability on February 7 revealed that the European Bank for Reconstruction and Development has cancelled a loan to develop offshore oil reserves in the Caspian Sea. According to Crude Accountability, that loan was intended to underwrite development plans devised by the Dubai-based and state-controlled company Dragon Oil. It is unclear how this will affect the firm's plans to bump up its Turkmen output figures, but it does not sound like promising news. Russian Foreign Minister Sergei Lavrov swung through Ashgabat on February 6 but volunteered little on what he had discussed other than to say the question of Gazprom resuming gas purchases did come up. А roundtable of analysts and journalists covering the region convened by RFE/RL spoke for more region-watchers, however, in surmising that these talks are unlikely to produce much of any worth. Turkmen state media nonetheless reported that Berdymukhamedov is holding out hope for "new far-reaching big agreements.” Lavrov did sign one reasonably pro forma cooperation document, but nothing in it seems worthy of note. The European Union ban on Turkmenistan Airlines flights has entered its second week and it does not feel like a resolution is imminent. As opposition-linked website Gundogar pointed out, Turkmenistan Airlines has had to resort to placate customers by chartering a plane from a Spanish company to service its more popular routes from Birmingham, in England, to India. Given what problems Turkmenistan is experiencing with getting its hands on hard foreign exchange, it is not certain this arrangement can survive long. Orient, a government-friendly outlet based in Ashgabat, took a valiant bash at trying to spin this whole debacle. In a February 10 article in English, the website argued that the European Aviation Safety Agency suspension was triggered by “discrepancies in the American and European systems that define the requirements and standards for the operation of aircraft.” The Turkmenistan Airlines fleet is made up almost entirely of U.S.-made Boeing aircraft. In other words, Orient argued, this is simply a bureaucratic snafu that will be resolved once the correct paperwork is filed. That only prompts further questions. The national carrier has, even by Orient’s admission, been aware of this supposed issue for more than two weeks at the very least, so why has the problem not been solved? Adding insult to all this injury, the U.S. Embassy in Turkmenistan has announced that its staff is now barred from using the airline, including for domestic flights.